For the British naval architect, see Isaac Watts (naval architect). "When I Survey the Wondrous Cross", "Joy to the World", "Our God, Our Help in Ages Past"
Isaac Watts (17 July 1674 – 25 November 1748) was an English Christian minister (Congregational), hymn writer, theologian, and logician. He was a prolific and popular hymn writer and is credited with some 750 hymns. He is recognized as the "Godfather of English Hymnody"; many of his hymns remain in use today and have been translated into numerous languages. Watts was born in Southampton, England in 1674 and was brought up in the home of a committed religious nonconformist; his father, also Isaac Watts, had been incarcerated twice for his views. Watts had a classical education at King Edward VI School, Southampton, learning Latin, Greek, and Hebrew. Watts could not attend Oxford or Cambridge because he was a nonconformist and these universities were restricted to Anglicans—as were government positions at the time. He went to the Dissenting Academy at Stoke Newington in 1690. Much of the remainder of his life centered on that village, which is now part of Inner London. Following his education, Watts was called as pastor of a large independent chapel in London, Mark Lane Congregational Chapel, where he helped train preachers, despite his poor health. He held religious opinions that were more nondenominational or ecumenical than was common for a nonconformist Congregationalist. He had a greater interest in promoting education and scholarship than preaching for any particular sect. On the death of Sir Thomas Abney in 1722, his widow Lady Mary and her unmarried daughter Elizabeth moved all her household to Abney House from Hertfordshire, and she invited Watts to continue with them. He particularly enjoyed the grounds at Abney Park, which Lady Mary planted with two elm walks leading down to an island heronry in the Hackney Brook, and he often sought inspiration there for the many books and hymns that he wrote. 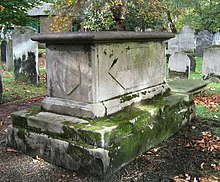 Watts lived at Abney Hall in Stoke Newington until his death in 1748; he was buried in Bunhill Fields. He left an extensive legacy of hymns, treatises, educational works, and essays. His work was influential amongst nonconformist independents and religious revivalists of the 18th century, such as Philip Doddridge, who dedicated his best-known work to Watts. Sacred music scholars Stephen Marini, Denny Prutow and Michael LeFebvre describe the ways in which Watts contributed to English hymnody and the previous tradition of the Church. Watts led the change in practice by including new poetry for "original songs of Christian experience" to be used in worship, according to Marini. The older tradition was based on the poetry of the Bible: the Psalms. According to LeFebvre, Psalms had been sung by God's people from the time of King David, who with a large staff over many years assembled the complete book of Psalms in a form appropriate for singing (by the Levites, during Temple sacrifices at the time). The practice of singing Psalms in worship was continued by Biblical command in the New Testament Church from its beginnings in Acts through the time of Watts, as documented by Prutow. The teachings of 16th-century Reformation leaders such as John Calvin, who translated the Psalms in the vernacular for congregational singing, followed this historic worship practice. Watts was not the first Protestant to promote the singing of hymns; however, his prolific hymn writing helped usher in a new era of English worship as many other poets followed in his path. Watts also introduced a new way of rendering the Psalms in verse for church services, proposing that they be adapted for hymns with a specifically Christian perspective. As Watts put it in the title of his 1719 metrical Psalter, the Psalms should be "imitated in the language of the New Testament." Besides writing hymns, Isaac Watts was also a theologian and logician, writing books and essays on these subjects. Watts wrote a textbook on logic which was particularly popular; its full title was, Logic, or The Right Use of Reason in the Enquiry After Truth With a Variety of Rules to Guard Against Error in the Affairs of Religion and Human Life, as well as in the Sciences. This was first published in 1724, and it was printed in twenty editions. Watts wrote this work for beginners of logic, and arranged the book methodically. He divided the content of his elementary treatment of logic into four parts: perception, judgement, reasoning, and method, which he treated in this order. Each of these parts is divided into chapters, and some of these chapters are divided into sections. The content of the chapters and sections is subdivided by the following devices: divisions, distributions, notes, observations, directions, rules, illustrations, and remarks. Every contentum of the book comes under one or more of these headings, and this methodical arrangement serves to make the exposition clear. In Watts' Logic, there are notable departures from other works of the time, and some notable innovations. The influence of British empiricism may be seen, especially that of contemporary philosopher and empiricist John Locke. Logic includes several references to Locke and his Essay Concerning Human Understanding, in which he espoused his empiricist views. Watts was careful to distinguish between judgements and propositions, unlike some other logic authors. According to Watts, judgement is "to compare... ideas together, and to join them by affirmation, or disjoin then by negation, according as we find them to agree or disagree". He continues, "when mere ideas are joined in the mind without words, it is rather called a judgement; but when clothed with words it is called a proposition". Watts' Logic follows the scholastic tradition and divides propositions into universal affirmative, universal negative, particular affirmative, and particular negative. In the third part, Watts discusses reasoning and argumentation, with particular emphasis on the theory of syllogism. This was considered a centrally important part of classical logic. According to Watts, and in keeping with logicians of his day, Watts defined logic as an art (see liberal arts), as opposed to a science. Throughout Logic, Watts revealed his high conception of logic by stressing the practical side of logic, rather than the speculative side. According to Watts, as a practical art, logic can be really useful in any inquiry, whether it is an inquiry in the arts, or inquiry in the sciences, or inquiry of an ethical kind. Watts' emphasis on logic as a practical art distinguishes his book from others. By stressing a practical and non-formal part of logic, Watts gave rules and directions for any kind of inquiry, including the inquiries of science and the inquiries of philosophy. These rules of inquiry were given in addition to the formal content of classical logic common to textbooks on logic from that time. Watts' conception of logic as being divided into its practical part and its speculative part marks a departure from the conception of logic of most other authors. His conception of logic is more akin to that of the later, nineteenth-century logician, C. S. Peirce. Watts followed the Logic in 1741 by a supplement, The Improvement of the Mind. This also went through numerous editions and later inspired Michael Faraday. It was also widely used as a moral textbook in schools. London's only public statue to Isaac Watts is in Abney Park, Stoke Newington. On his death, Isaac Watts' papers were given to Yale University in the Colony of Connecticut, which nonconformists (Puritans/Congregationalists) had established. King Edward VI School, Southampton, which he attended, named one of its houses "Watts" in his honour. The Church of England and Lutheran Church remember Watts (and his ministerial service) annually in the Calendar of Saints on 25 November, and the Episcopal Church on the following day. The earliest surviving built memorial to Isaac Watts is at Westminster Abbey; this was completed shortly after his death. His much-visited chest tomb at Bunhill Fields dates from 1808, replacing the original that had been paid for and erected by Lady Mary Abney and the Hartopp family. A stone bust of Watts is installed at the nonconformist Dr Williams's Library, in central London. The earliest public statue, erected in 1845, stands at Abney Park, where Watts had lived for more than 30 years at the manor house, where he also died. The park was later devoted to uses as a cemetery and public arboretum. A later, rather similar statue was funded by public subscription and erected in a new Victorian public park named for Watts in Southampton, the city of his birth. In the mid-nineteenth century, the Congregational Dr Watts Memorial Hall was built in Southampton and named for him. After World War II, it was lost to redevelopment. The Isaac Watts Memorial United Reformed Church was built on the site and named for him. One of the earliest built memorials may also now be lost: a bust to Watts that was commissioned on his death for the London chapel with which he was associated. The chapel was demolished in the late 18th century; remaining parts of the memorial were rescued at the last minute by a wealthy landowner for installation in his chapel near Liverpool. It is unclear whether the bust survives. The stone statue in front of the Abney Park Chapel at Dr Watts' Walk, Abney Park Cemetery, was erected in 1845 by public subscription. It was designed by the leading British sculptor, Edward Hodges Baily RA FRS. A scheme for a commemorative statue on this spot had first been promoted in the late 1830s by George Collison, who in 1840 published an engraving as the frontispiece of his book about cemetery design in Europe and America; and at Abney Park Cemetery in particular. This first cenotaph proposal was never commissioned, and Baily's later design was adopted in 1845. In 1974, the City of Southampton (Watts' home city) commemorated the 300 year anniversary of his birth by commissioning the biography Isaac Watts Remembered, written by David G. Fountain, who like Watts, was also a nonconformist minister from Southampton. One of Watts' best-known poems was an exhortation "Against Idleness and Mischief" in Divine Songs for Children. This was parodied by Lewis Carroll in the poem "How Doth the Little Crocodile", included in his book Alice's Adventures in Wonderland. His parody is better known than Watts' original poem. The poem was also featured in the segment on the cartoon programme "Rocky and His Friends" called "Bullwinkle's Corner", in which Bullwinkle Moose recites poetry. In this case, the poem was titled "The Bee", with no author credit. In his novel David Copperfield (1850), Charles Dickens has school master Dr. Strong quote from Watts' "Against Idleness and Mischief". The 1884 comic opera Princess Ida includes a punning reference to Watts in Act I. At Princess Ida's women's university, no males are allowed. Her father King Gama says that "She'll scarcely suffer Dr. Watts' 'hymns'". A poem often referred to as "False Greatness" by Joseph Merrick ("The Elephant Man"), which was used in writing or "signature block" by Merrick, starting "Tis true, my form is something odd but blaming me, is blaming God..." is often (incorrectly) quoted or cited as a work by Isaac Watts. In fact only the last few sentences were penned by Watts ("False Greatness", book II-Horae lyricae 1743) starting "Mylo, forbear to call him bless'd That only boasts a large estate..."
Watts is thought to be the author of the tract: An Essay on the Freedom of Will in God and Creatures (copy on The Internet Archive). Many of Watts' hymns are included in the Anglican Hymns Ancient and Modern, the Oxford Book of Common Praise, the Christadelphian hymnal, the Episcopal Church's Hymnal 1982, Evangelical Lutheran Worship, the Baptist Hymnal, the Presbyterian Trinity Hymnal, and the Methodist Hymns and Psalms. Many of his texts are also used in the American hymnal, The Sacred Harp, using what is known as the shape note notation used for teaching non-musicians. Several of his hymns are used in the hymnals of the Church of Christ, Scientist and The Church of Jesus Christ of Latter-day Saints. ^ Mable, Norman, Popular Hymns and their Writers, p. 179 . ^ Boreham, F. W. (1945), A Late Lark Singing, p. 29 . ^ a b Marini 2003, p. 76. ^ Marini 2003, p. 71. ^ Marini 2003, p. 76 lists hymn writers who followed in the tradition established by Watts, including Charles Wesley, Edward Perronet, Ann Steele, Samuel Stennet, Augustus Toplady, John Newton, William Cowper, Reginald Heber, Samuel Davies, Timothy Dwight, John Leland, and Peter Cartwright. ^ Watts 1825, p. 14. ^ Watts 1825, p. 115. ^ Watts 1825, p. 117. ^ Historic England. "Monument to Isaac Watts, East Enclosure (1396517)". National Heritage List for England. Retrieved 24 February 2014. ^ Watts, Isaac, The Poems of Isaac Watts, Volumes 44–46, Press of C. Whittingham, 1822, p. 193. Jones, J. A., ed. (1849). Bunhill Memorials: sacred reminiscences of three hundred ministers and other persons of note, who are buried in Bunhill Fields, of every denomination. London: James Paul. pp. 298–304. Marini, Stephen A. (2003). Sacred Song in America: Religion, Music, and Public Culture. Urbana: University of Illinois Press. Thorncroft, Michael (1958). "The Fertile Soil; The Church is Built; The Early Years (1714–1758); The Age of Richard Price; New Causes for Old; The Ideal of Service; The Lights Go Out; The Present Day". Trust in Freedom: The Story of Newington Green Unitarian Church 1708–1958. Privately printed for church trustees. .
Watts, Isaac (1825). Logic or the Right Use of Reason in the Inquiry After Truth; with a Variety of Rules to Guard Against Error in the Affairs of Religion and Human Life, as well as in the sciences (reprint ed.). US: Kessinger. .
Wikimedia Commons has media related to Isaac Watts. This page was last edited on 19 April 2019, at 14:04 (UTC).